If you used Twitter or Facebook you may think that Instagram is as easy as those two platforms, but in fact, it has its own nuances. When you do things right, you get the results with Instagram. 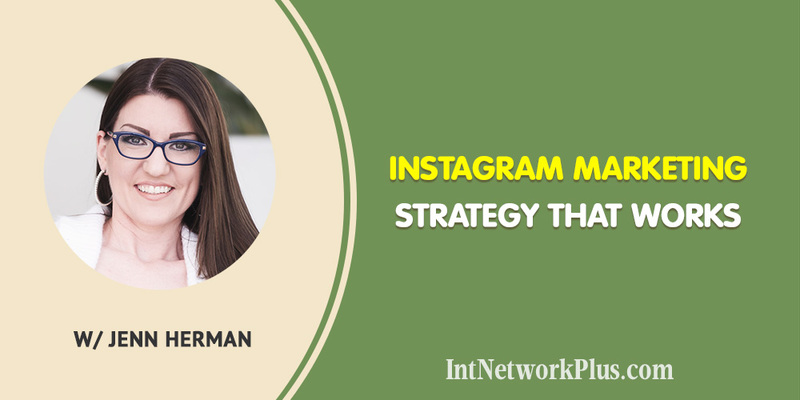 In this episode, Jenn Herman shares Instagram marketing strategy that works. We will talk about the hashtag strategy, growth tactics, Instagram algorithm, and the ways to build your engaging community. Jenn is a social media consultant, speaker, and globally recognized Instagram expert. She is the forefront blogger on Instagram marketing and her blog, Jenn’s Trends, has won the title of a Top 10 Social Media Blog in 2014, 2015, and 2016. Jenn provides training, tips, and resources for small to medium-sized businesses that need to structure their social media strategies. A lot of people knows who Jenn is. Those who use Instagram. Please share with us your story. How did you become an Instagram expert? It was kind of a lucky situation, I guess, in some ways. Being in the right place at the right time. I started my blog in January of 2013. That was a hobby. I didn’t have any business plan for it. It was just something to kind of share some experiences that potentially help people understand social media. But with my blog, focusing on social media, I was like, I need to understand Instagram. And I just fell in love with it. I love the platform. I love photography anyway, so I really liked it. I loved that people were so interactive and it was so easy to get engagement and have this community almost out of nowhere. 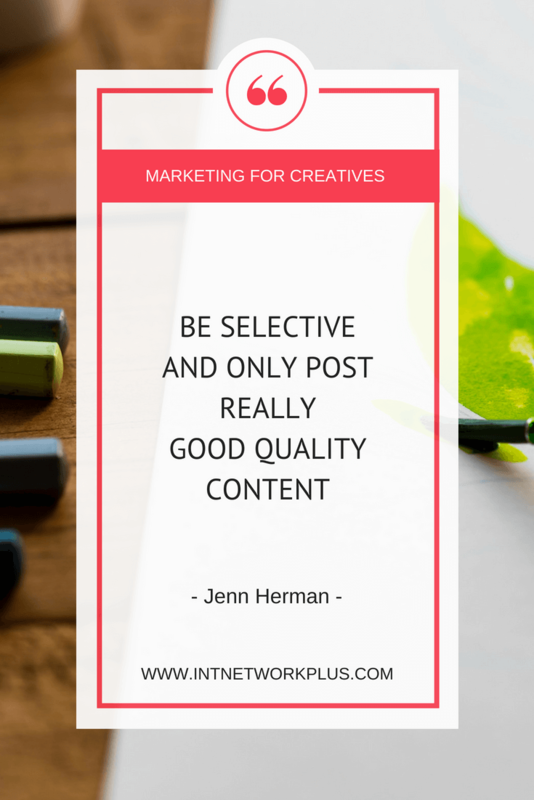 I started thinking, “OK, how can I use this as a marketing tactic, not just for personal use.” In doing that, I was finding that no one else was really blogging or giving good quality tips about it. If you go back and read some of my older blog posts they’re definitely different than what they are now. They were definitely much more beginner level. But it was fun doing that. I was able to kind of set myself apart. And like I said, it wasn’t my intention to become an Instagram expert. I was just building a voice behind some skills. In that process of doing that people started to recognize me as an expert, inviting me on podcasts and shows and then I started getting invited to speak at events. Now I’ve written Instagram for Business for Dummies. I’m the world’s forefront blogger on Instagram marketing. I get to work with amazing people around the world. When they get new Beta features, they’d contact me and tell me what they’re testing out. I get to work with a lot of companies and see what they’re doing on the back end. It’s great. I love every opportunity to be able to see what’s going on, what other people are doing with the platform as well. But it’s definitely a fun thing to be a part of. Yes. That’s a fun thing. I like Instagram. There is so much interaction these days. Let’s say people already have the account. They have a business account there and they have some followers. They post their content. They engage with people somehow, but they got stuck there. It seems that it doesn’t really bring too much to their business. 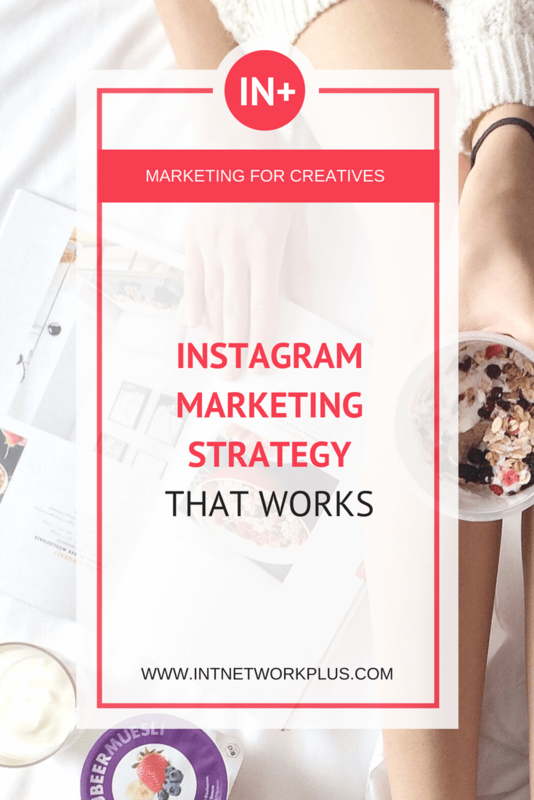 How to develop an effective Instagram marketing strategy for business? The first thing is you need to understand if you’re using it for business. If that’s your decision, then you need to start treating it as part of your business as part of your entire toolbox. It doesn’t mean that it is a marketing blast. You’re not out there to just market and just push your product 24/7. It has to be more of a community tool. And that’s I think one of the things that people struggle with is that they want to use it for business, then immediately they go hundred percent business. Everything is what you have for sale, or why is this going to be discounted, or how to get this at this event or whatever it is. You start putting things in a very salesy way. Versus when it was a personal account, everything was very casual and it was very like, “Hey, this is what I’m doing. These are my kids are. This is my dog. This is my family.” People go kind of one extreme to the other. If you’re gonna commit to it being a business account, great, but you need to find that happy medium between the two kinds of aspects of it and actually build it more as a community tool. You do want to share that behind the scenes of your life, whether it’s as an artist or as a writer, or a photographer or whatever it is that you do in a creative space. You’re more than just the art you create. You have a family and you have a personality and you have your own style and you have your personal interest and you have the things that you do as that creative. You really want to share that whole aspect of it from an Instagram perspective. Then within that, you can do those occasional sales type posts where you say something along the lines of, “Here’s a piece I’ve been working on for a really long time. It’s going to be available at this show coming up in a month. If you want tickets to the show, let me know and I’ll get you on the VIP list.” Or something like that. You really want to think about what that voice is. How you can connect with people in a much more personal way and that will really help you on that journey. As you say, people go from one extreme to another, so what they should focus more when they work on their Instagram marketing strategy: grow followers, selling, building community, bringing traffic to the blog? Which one? I’d say building community 100%. Because everything else will build off of that. If you have a thousand loyal followers who follow everything you do and listen to everything you have to say, they’re going to click on your website when you tell them to. They’re going to show up in an event when you tell them to. They’re going to buy when you have something available. But if you don’t have that loyal community, they’re not going to take action. You can get 5,000, 10,000, 50,000 followers, but if they’re random people who don’t genuinely have an interest in what you’re creating, you’re going to do all this work to try to give them content and they’re not going to take any action on it. You’re better off focusing on building that community. Really having that voice. Interacting with people. Asking questions or comments on your posts. Have a dialogue back and forth. Really start to build those relationships. I’ve got people that call me up and actually, I just had a client I worked with a couple of weeks ago that literally has been following me online for three years. It took her three years to work with me. In a paying capacity. But again, I was there on social media every week. My blog was in her inbox regularly. She trusted me and she knew me enough to want to work with me, but that was three years. This isn’t something where it just happens overnight. It takes time to build those relationships and if you’re using Instagram to build that community, everything else will filter off of that. What do you think how people can build this community if they have some followers it is good, but they still need to bring new people in so it will grow and then they need to engage with them somehow? How would you do this? Some of the best ways to kind of grow your audience, to get new people to see you is to do something where either like a contest or a giveaway. That’s a great opportunity. And I always tell people if you’re going to do that, there have to be two criteria to enter the contest. One, they have to follow you and two, they have to tag a friend in the comment below, which means… or you can say tag two people in the comment below or whatever it is. But let’s assume that you have one of your followers that goes great, I want to win this contest I’m going to make… obviously they probably already follow you, but they’re going to tag two friends. Now, those two friends say, “Oh, that looks like a cool contest. I want to win.” Now, both of them follow you and tag two friends so you can see how that can grow exponentially. You want the prize to be something relevant to what you do. It could be a free print of one of your favorite pieces of artwork that you’ve created. It could be a free chapter of a book or a small eBook or something like that. Whatever it is in the creative space that you create, you want that price to be something related to what you create. You’re not just going to go away and give away a $50 Amazon gift card just for the sake of it. That’s not relevant to your audience. You want to build a loyal audience again through something relevant to what you do, but that’s valuable to them. You can also… definitely you want using hashtags. You want to be very strategic with your hashtags. 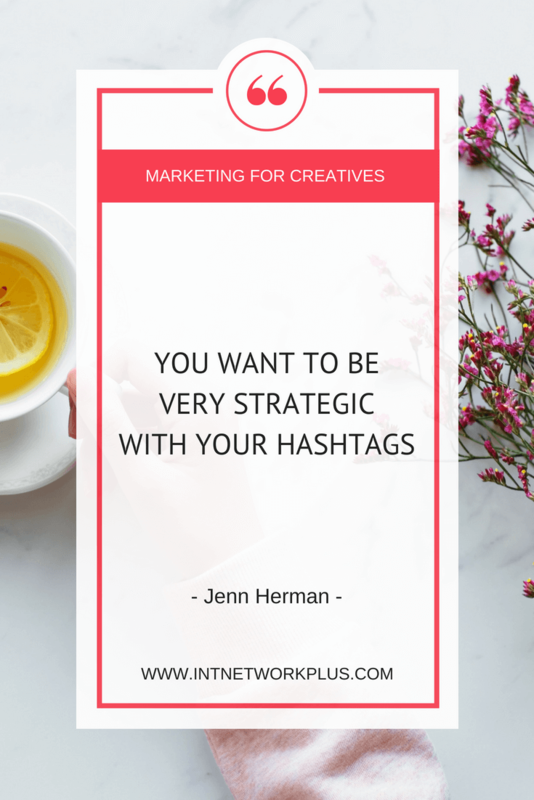 I have lots of blog posts on this topic if you’re going to jennstrends.com but you basically want to use a combination of really popular hashtags which are anything over about 500,000 results. You want to use a combination of those as well as moderately popular. Those in the kind of like a hundred thousand to 500,000 range. And then some really targeted specific ones. This is the ones that are gonna have maybe 10, 20, 30,000 posts associated with them, but they’re very, very specific to what it is you do. You may be a hashtag #artist, but that’s a massive, huge result, you’re never going to get found in that. You want to get down to maybe you do portrait artistry and maybe you do charcoal portraits or maybe you do oil paintings or maybe you do landscape watercolors. 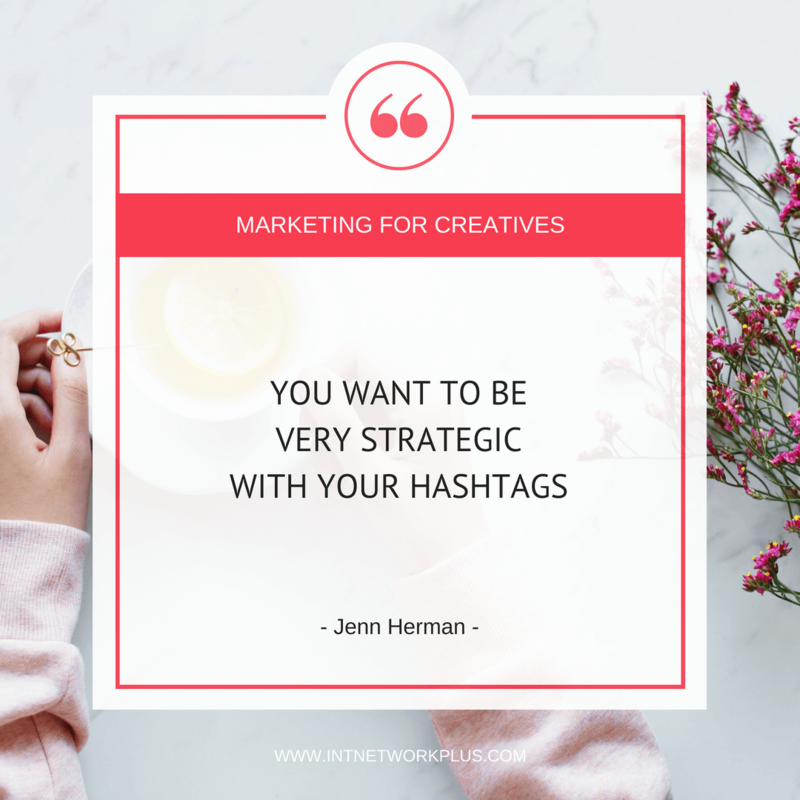 Whatever that is, you really want to find those super specific hashtags because now when someone goes and looks for those hashtags, they’re going to find your content and that’s how you’re going to build your audience through hashtags. You can also do shout outs or peer collaborations where you can work with other artists and creatives or other companies that align with what you do that aren’t your direct competitor. Let’s say that you do beautiful paintings. You could partner with a company that does framing or that does display lighting or that does home staging or something where it’s an alignment with what you do in terms of creating a product, but that isn’t necessarily in competition with you. So then they give a shout out to you and they talk about the beautiful artwork you create and you give a shout out to them talking about the beautiful work that they do to do framings or that sort of thing. Now you’re both reaching out to each other’s audiences in a mutually beneficial way and sharing audiences, potentially sharing customers and referrals and that sort of thing. Those are some of the best ways. There are lots of other tactics, there are lots of different things you can try, but those are all going to get you good targeted followers. That’s the biggest thing is that even if you’re only growing at 10 followers a week, it’s still growth. And as long as you’re growing with the targeted follower base, you’re always going to make sure that you’re increasing your chances for more sales or more website traffic because they’re genuinely interested in what you have to offer. When you search for the hashtags, how would you pick those which are relative to your audience, which your audience we’ll search for? Because sometimes there can be hashtag like #socialmedia, but there is a lot of trash with this hashtag and not many people will search for it. Or #photography. There can be photographers and a lot of naked girls. Yes, absolutely. That’s why you do want to be selective when you’re going in. Go into Instagram, kind of go… I always say just do it old school, just go in and just go to the search criteria on Instagram and just start typing in hashtags and you’ll see the results that come up. Doing something like hashtag #photographers going to get a bazillion results and most of them are going to be unrelated to what you do. Then you can turn around and say, OK, maybe there’s a geographical location. Like I’m in San Diego so I could do #SanDiegoPhotographer, and then that’s going to be a more targeted audience. Not to mention if my potential client is looking for a photographer in San Diego, they’re more likely to look for hashtag #SanDiegoPhotographer versus just hashtag #photographer. Likewise, I may be looking for a wedding photographer. In which case I might look for #SanDiegoWeddingPhotographer, not just #SanDiego. Till now I’m getting super, super niche targeted by getting down to that #SanDiegoWeddingPhotographer that if someone was looking for that, they’re likely to find my content in that. But you really do have to figure out what those key things are that you want your audience to find you for and really think about what kind of that aligns with it. You may be known for doing portrait photography, but you want to branch out and do something else, so you need to think about what other hashtags and things that are related to that new content that you still want to get recognized for and see if you can start getting some traction there as well. What do you think about those tactics like follow for follow or commenting on other people’s accounts? Follow for follow absolutely No. I do not support them. I hate them. There’s absolutely no reason why anybody should follow for follow because all you’re doing is growing your audience of people who don’t care about you. You’re just getting a whole bunch of people in your account that you have no interest in their content. Instagram should be fun when you log into it and scroll through your feed and if you’re doing follow for follow, you’re getting the most random people, then you don’t want to go look at your Instagram feed because you don’t even like the content that’s in there. Totally do not encourage that at all. In terms of things like commenting, if there are people that are relevant to what you do and if you’re going to go and leave a comment because they’re either a good potential alignment or potential influencer or somebody that’s in the creative space that you’d like – absolutely. Ask something real as a question, or say something along the lines of what it is that made it valuable to you. Like, “I really love this aspect of this painting or whatever that was. This was really inspiring to me. I really, really appreciate this piece” or something along those lines. You really do want to make sure that you’re having legitimate conversations with people if you are leaving those comments. How to create this active community on Instagram? Active and engaged. What will it depend on posting regularly, using hashtags, commenting? It’s a combination of multiple factors. First of all, you have to be present. You need to be on Instagram. You need to be following people that are relevant to you, that you find interesting, people in your industry, that sort of thing. And you need to be going through and liking people’s posts. You need to be actively engaged. The more actively engaged you are, the happier Instagram is with you. So they want you to be engaged. But it also benefits you to be out there and actually interacting with other people. That does actually bode well for you in terms of building those relationships and that reputation. In terms of posting schedule, I actually tell people less is better. Don’t feel like you have to post every single day. If you only have enough content to post once a week, that’s OK. If you only can post two to three times a week, great. Do that. But don’t feel like you need to post for the sake of posting. You really want to put up only the best quality content and content that’s really relevant to your audience. Don’t just kind of post just to say, “Oh, I checked that box tonight. I posted something on Instagram.” If it’s not relevant, if it doesn’t serve your purpose, then don’t post it. 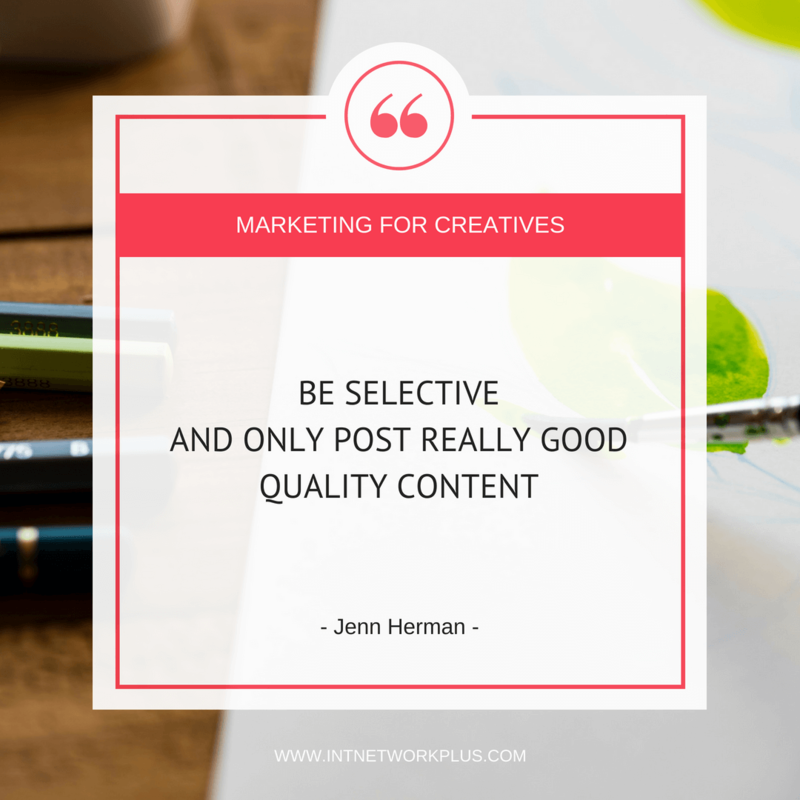 Be selective and only post that really good quality content. Make sure your photos do stand out in the feed. You want something that’s a really high-quality photo that has good lighting, good composition. It’s been edited whether you’re using filters or external apps or Photoshop or whatever it is. You want a really good quality photo that stands out in the feed. Busy photos don’t usually perform as well on Instagram. Meaning if there’s a lot of stuff in the background if there are 30 people in the photo that’s really distracting. If you can get that piece at standing on the pedestal or that’s on display in the gallery when there are no people around it, that’s going to perform better because it’s not as busy of an image. And again, looking at the editing on that to bring it as bright as possible. Brighter colors, desaturations, those sorts of things, anything that’s going to make that piece really kind of stand out is going to help you. Then you want to have a good descriptive caption. Your caption should be in your voice. It should talk about what is relevant to that. That image or that video has to shove that context and it relates to tell that story. Let’s say it was the image of something at a gallery. What was this piece about? Is it you or was it somebody else? What was inspiring about it? Really take the time to write a good story in your captions so again, people feel connected to it and don’t be afraid to ask a question or that sort of thing in your comment or in your captions to engage a bit more. Have you ever worked with this artist? Have you ever met this artist? Do you find this piece as fascinating as I do? What’s the favorite thing you’ve ever seen at the gallery? What about the statement that you should be consistent with your content? You said that you can post once a week, three times a week, whatever you want. You definitely want to be consistent in the sense of if you have the decision to post once a week, then post once a week every week. Don’t show up and post four times this week and then take two weeks off and then post three times in one day and then take a week off and then post three times that week and then take a week off and then post once. That’s a regular. That confuses your audience because they don’t know what to expect from you. If you’re at an event or doing a launch or something like that, things are a little bit different because you probably have a bit more content around those things. But that’s where you can use an album where you can create 10 posts in one. You can have 10 photos or videos in one, either carousel or album, whatever you want to call it. It would be one post that has multiple images in that one post if you’re at an event. You could use your Instagram stories as a way to show much more content because that’s going to disappear in 24 hours and not live on in that way. There are other ways that if you were at something where had a lot of content creation. You could still share that. But you definitely want to be consistent. Meaning if you have enough content to share once a week that’s kind of your commitment. You agree to show up once a week and you’re there every single week with new content. Because just showing up regularly isn’t necessarily good for your content strategy. And it does confuse your audience. They don’t have that reliability of when you’re going to be there. When you search for the hashtags relative to your audience, to your content, would you put this same or almost the same hashtags all the time? Or will you rotate them or change all the time? There’s always like a good core that you should have. There might be 8 or 10 or 12 that are your core hashtags that you use on everything. There could be your branded hashtags for your specific brand. They’re really niche-specific ones in terms of the type of creative work that you do. Like it could be the hashtag #OilLandscapePainting or something like that. Whatever those super targeted ones are that are very specific to what you do would be consistency. You might have like eight to 10 maybe 12 that are very consistent and use all the time. And yes, it is completely OK to use the same hashtags all the time. People try to tell you that’s not OK. It’s totally fine. I do all the time. Then you want your other hashtags to be relative to that piece of content. Let’s say that painting you did was of a specific beach so you could have that location. You could have things like #beach and #SummerDays or #SummerInspiration or things like that. That again, aren’t your normal hashtags that are relevant to the content of that post. So you’re going to mix and match your standard kind of everyday ones that you always use your content and then the other ones that are contextual to each individual post. Hmm. Interesting. Jenn, let’s say some people have less than 10,000 followers. When there are not too many followers and still when you just growing people not really engaged. So, organizing contest won’t bring too many people. But they still want to grow. And when you have 10,000 followers then you can add links to your Instagram stories, little benefits. How those people can grow their accounts to like 10,000 or a little more followers to create more engaged community and to reach more people. Like I said, the contests are usually slower going. But you can definitely look at doing things. I said that the shout-outs or the collaborations because if you partner with other companies, they’re more likely to be able to give that exposure to you on a quicker basis. That goes for contests as well. 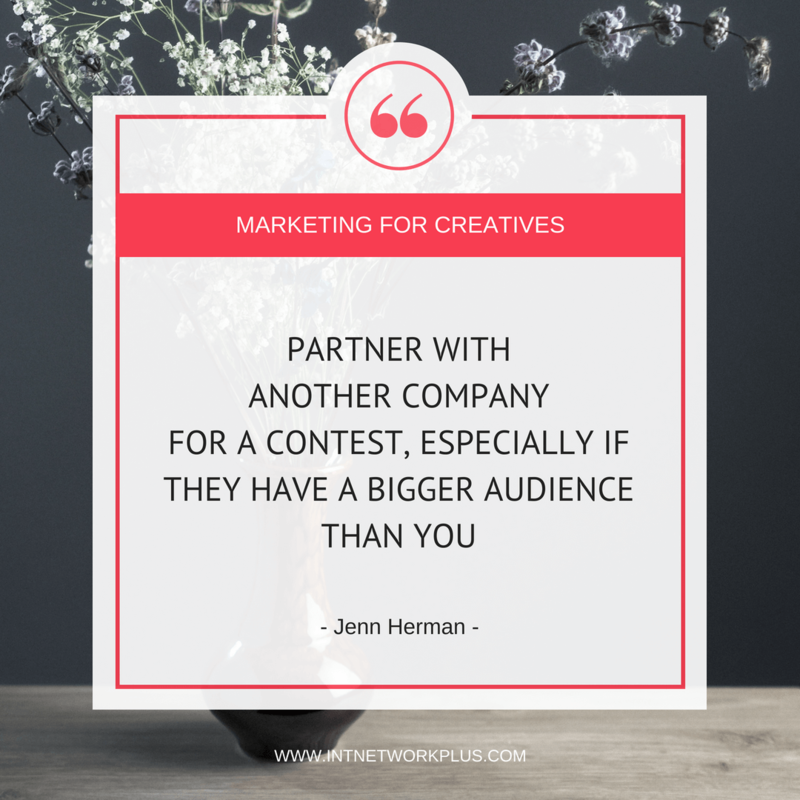 You can partner with another company for a contest, especially if they have a bigger audience than you. That doubles your capacity for that participation in the contest. The contest rules would be to follow both of your accounts and tag two people in the comments below. Their audience is going to do that, your audience. 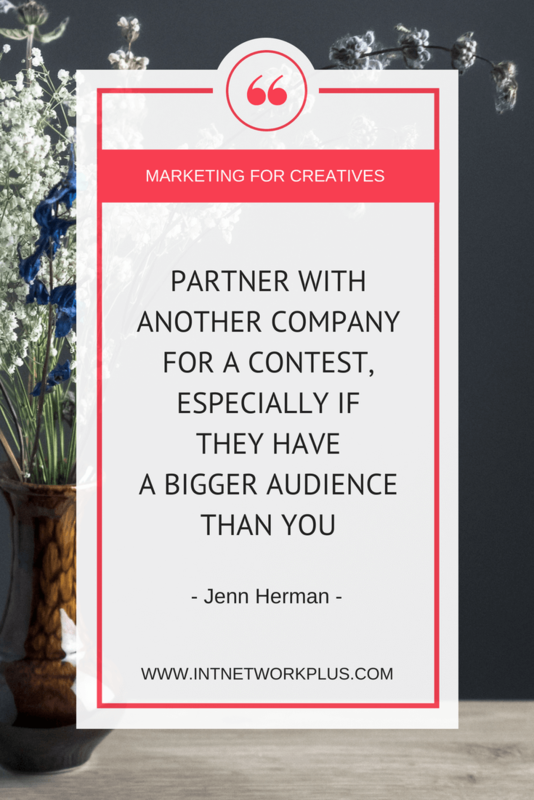 You can partner with somebody else to get that duplicate effort and participation in a contest. Other things you can do is define specific hashtags that are related to your industry. Let’s say there was an art show going on, or there’s some sort of event that is related to your potential target audience. Meaning, people who are potentially going to be interested in buying your artwork. People who are in the same art industry, whether they’re art reviewers or any of those sorts of things. Maybe there’s an event at a gallery and maybe there’s a big event or trade show type thing going on. You want to find the hashtags for those events and go look at that hashtag on Instagram and go through like everybody’s content on that hashtag. Let’s say there was a big gallery event that somewhat local to you, even if it’s not local to you, but you go through and you’re going through and you’re scrolling and liking all of the content by people created on this hashtag for that event. You show up in their notifications and they’re more likely to be like, “Hey, who’s this person?” They’re going to come over and see that you’re an artist, that you have this content. And if they like it, they’re going to follow you. Now again, I do this for every big social media conference that’s going on and I can get anywhere from like 10 new followers to 100 new followers from one event. It depends on the size and the relevancy of that audience to who I am and they’re interested in following me. But that can be another way to get a bit more of an exponential growth. Like I said the hashtag strategy that I recommend is I just had one of my clients message me two days ago and she just grew by 130 followers in the last week using my hashtag strategy and she’s a small account. She’s only got a few hundred people sort of grow by 100 was a big amount of growth for her. It absolutely can be done. It just takes time and commitment and reality that you’re not going to have 10,000 followers in a month. Any other strategies that going to tell you that you can do that are usually working with not the best-recognized practices they’re using the like for likes, they are using automated tools or they’re starting out with accounts that have really big potential audiences. You have to realize too that when you’re in the creative space, you don’t have a huge audience necessarily. It is nice to get to that 10,000 to have that swipe up link in the Instagram stories. But you can run an Instagram story ad at any size that will have a swipeable link in it. If you’re willing to put some ads spend behind it, you don’t need to wait for that 10,000 followers. You can still do that through ads and get the same effect. Jenn, let’s touch the favorite discussion topic of people. What about the Instagram algorithm? Because people say like “A lot of people do not see my post and maybe similar to Facebook.” So what are your thoughts about this? First of all, I always remind people that Facebook and Instagram are not the same and that when Facebook does changes, that doesn’t mean Instagram made changes. People tend to jump on the “Oh, Facebook did something.” Then they assume Instagram did the same thing and it is a hundred percent not the case. Again, when it comes to the Instagram algorithm, the way it works, it’s very individual user focused. Meaning if you always liked five people’s content, those five-people’s content is always going to show up at the top of your feed. Because you always interact with their content. If you always interact with a certain type of content, meaning let’s say you really like dogs and you always like content with dogs than anybody you follow that has content with dogs will show up higher in the feed. There’s an AI working in the background that recognizes the content and will try to give you as much recognizable content. If you never interact with certain people and every time they post in your feed you scroll past them, they are going to go lower and lower in your feed. There is a small value placed on popularity. Meaning, if my post is super popular and everybody that sees it loves it. You have a chance of seeing that post in your feed because my post as popular, but it’s not a huge determinant factor. On Facebook, that’s a big factor. On Instagram, the individual user interaction is much more relevant than the popularity of that post in general. In terms of the algorithm, you want to cater to your audience, you want to make sure that you’re creating content that they actually like and interact with it. If they like and leave comments, then they are more likely to see more of your content. If every time they see your content, they scroll past it and ignore it, they’re going to see less of your content every single time. You really just want to focus on creating content that they engage with. Find out through your analytics which posts are getting the most reach, which posts have the best engagement ratios and then from there figure out what works. Is it when you share something that has the picture of you in it? Or is it something where you have a lot of the color blue or the color yellow? What is it that best-performing post for your audience? And create more of that content. Because that’s what’s going to help you with the algorithm more than anything else. Worrying about things like posting times does not matter. Posts when it’s convenient to your audience, but it again, with the algorithm, if your audience logs on at [9:00] PM and you posted it at 2 am they’re still going to see it because they like your content no matter what time you posted. It’s not too big of a deal to stress about that. You don’t have to worry about how many hashtags or how many comments or where to put the hashtags. None of those things matter. As long as you don’t go over 30 hashtags. That’s the limit. Anything less than 30 is completely fine. Don’t stress about those things and you will be OK, I promise. So just post and make people engaged, but that it means that you need to have likes on your posts, that people need to ‘like’ your posts or comment. Well, commenting is maybe not too often, but then people can start chasing for likes. What would you do in this situation? What would you pay attention to? How would you measure this engagement? Again, you want to look at your analytics on all of your posts. Once you have a business profile on Instagram, you get enough analytics. You can go to the analytics and you can actually go and see what your top performing posts are. You can go and look and see your top performing posts in the last week, last month, last quarter, last year. You can search by engagement. You can search by reach. You can search by impressions. You can literally go in and find out what your top performing posts are. Then again, look and see what is consistent. Was it something in the caption? Was it something in the photo? Did you ask a question that they actually answered? Did you post something that was totally raw and random and hilarious versus your normally overly posed perfect photos? Figure out what it is about those top performing posts and then try creating more of that. So if you find that your audience likes when you’re more casual, great, start being more casual. If your audience likes to see more photos of your family or your dog mixed in, great, put more of them in there. Whatever you can do. That’s what they’re responding to that’s what you need to give them. When you give them a post, which they like, automatically those posts where you, for example, promoting your stuff or put some other content will anyway get higher in their feed. Right? Exactly. Because if let’s say you put out five posts that are a hundred percent what they typically interact with and they like all of those posts, then your next one is most likely going to show up higher in their feed. It’s not a guarantee, but you have a higher percentage of probability that they’re going to see those promotional posts as well. But again, you don’t want to make it overly promotional. If you can tie that into every single post… You can have a post of your dog and it’s something everyone relates to, but in that post you can say something about your dog sitting there waiting for you to stop painting and take her out for a walk because you’re stuck painting again and you’re trying to finish this painting so you can have it ready for them to see it and you can’t wait to show it to them. It became promotional because you talked about the fact that it was a thing you’re working on for work and it’s a painting and you can’t wait to show them the finished piece, but you did that while showing a photo of your dog. You can take something that is quality content that they want to see, which is the dog and still give them a message that you want them to hear, which is a little bit more promotional. So, kind of create the mix between capture and the photo. 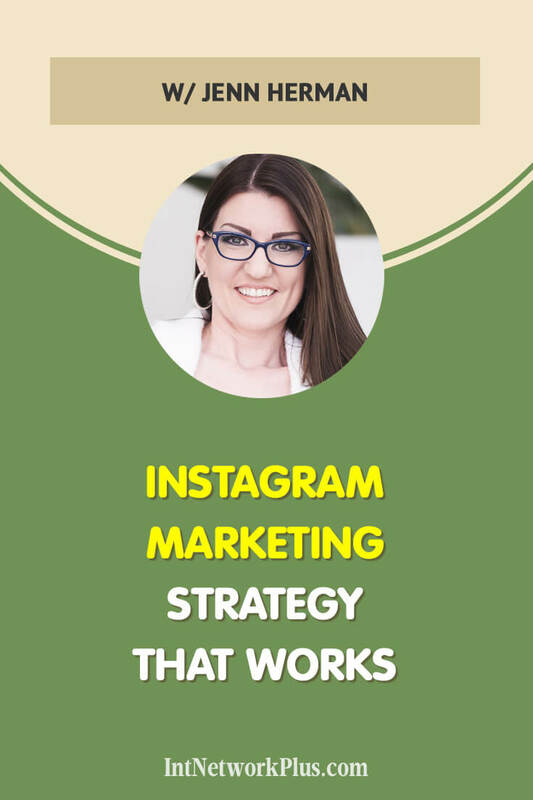 Jenn, if people would want to create their Instagram marketing strategy for the business, what would be the main three things that they will need to focus on? First of all, they need to create kind of a content calendar figuring out when they want to post, how often do they want to post and what is that content going to be. If you’re going to post twice a week, what are those posts going to be each week? Think about things that are going on. Do you have events coming up that you’ll want to be promoting? Do you have a specific timeline for pieces that you’re creating and when those are going to be available? There seasonal things to think about whether it’s spring, winter, summer, fall, back to school, graduation season, any of those sorts of things. If you do photography, there’s a lot of emphasis around maybe graduation season or those sorts of things. Think about that seasonal content and how does that tie into your content strategy. You really want to have some sort of a calendar that talks to what are you going to create. And then with that, then you can make a plan to create that content. Because inevitably what happens is you sit there and go, “Oh, I haven’t posted anything this week. It’s Thursday night, I should post something. Alright. Snap a photo.” And it’s not planned. It’s not strategized. It’s not well created. But if you sit there and go, “OK, I know I’m going to have this content for the next four weeks. I’m going to need to stage this little mini photo shoot in my backyard. I’m going to need to go to the studio to get photos of this. You can make sure you go when it’s sunny with good daylight and plan accordingly so you’re not stuck at 8pm on a Thursday night with dark light and it’s not good exposure for the painting or the piece or whatever it is. You really do want to make sure that if you have that content calendar that will help you plan out your content strategy. You really want to think about the captions that are going to augment those. What is the purpose of your content? Is your strategy to get more followers? Is your strategy to get more website clicks? Is your strategy to get more people into your gallery, your store, whatever it is? What is it that you want out of that strategy? Then you’re going to create captions and content to augment that strategy. If your goal is to get people to come into your store, how are you going to do that? What are you going to do in your content that is going to get people to want to come into your store versus something where you’re trying to maybe get more followers, those sorts of things? You really need to have all of that in terms of your content strategy. Thank you very much, Jenn. Please share with us how can we connect with you and find more about you. I’m pretty much everywhere at jenns_trends and that’s Jenn with two Ns. So J-E-N-N-S underscore trends on Instagram and on Twitter. I’m on Facebook. I have a Facebook group. It’s Jenn’s trends in social media. Feel free to come join me in the group. We have a great conversation going in there all the time. Then my website is jennstrends.com and I have a ton of blogs. I’ve written well over a hundred blogs on just on Instagram marketing alone on my own website. So tons of resources that are free for you there if you have any questions about how to do Instagram marketing. Thank you so much, Jenn. It was a pleasure to have you here.